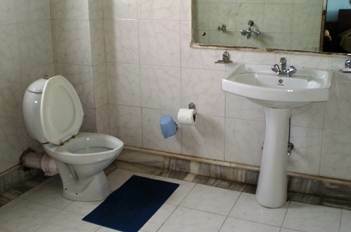 The Tourist Lodge in Darjeeling is a West Bengal state government run hotel and provides 2 star amenities in its main building as well as economy (low budget) rooms in the Annex building. From Mall road and opposite to the Gorkha Ranga Mancha building there is a steep bifurcation on the right which leads to the tourist lodge at the end. From the Mall, it's about 5 to 6 minutes walk. As you enter through the large iron gate into the lodge premises, the first impression is that it's a fairly large property compared to the other hotels in its category. There is a large open space in front along with a car park. The main building has 15 rooms. I have reviewed rooms in the Annex Building (which is located adjacent to the main building) in a separate section below. As you enter the main building, there is a small reception area right in front with a small lobby on its left. There is a corridor on the left that leads to the rooms at the ground floor. A stairway from the corridor leads to the room in upper floors. What I liked about the stairway is at every landing, there is a sofa seating arrangement with wonderful view of the valley through the large windows. This is an ideal place to have a cup of tea and enjoy the views. There are two types of rooms in the main building - Standard double rooms that are smaller in size but large enough for a comfortable stay. And there are large double rooms. Out of the large rooms, there are few that are mighty large and have separate dressing area with dressing table, large wall mirrors, sofa sets and such. If you take a large double room, then go for a real big one (for example room no. 15) as there is no difference in rates between different types of large rooms. However all rooms including the standard rooms have a wonderful covered private balcony at the back side. There are comfy chairs and tables placed there. The covered balconies have windows opening out to fantastic views of the valley and mountain range. From the balcony of the standard rooms you can see the Phuk Chiring Tea estate. From some of the larger room balconies you can get a lovely view of the Lebong Race Course. On a clear day, you can have great views of the snow peaks including the Kanchenjunga from almost all the rooms (from the balconies). The rate for single occupancy is 25% lesser than double occupancy. All the rooms have wall LCD TVs. The large rooms have Sony LCD TVs. The rooms have phones connected to EPABX system. They also provide room heaters during winter time. The bathrooms are really large and have geysers for hot and cold water. There is a lovely lush green lawn at the backside of the hotel. This garden can be seen from the balconies of the rooms. Although the lawn is used for private functions, anybody can otherwise go down to the lawn and enjoy the scenic views all around. You can clearly see the entire Eastern Himalayan range from the lawn. There is a small hut at one end of the lawn which is used to set up a bar or bar-b-que. On another side of the lawn there is a nice fountain where the water streams fall through the rocks. In the ground floor of the main building there is an in-house restaurant which serves Indian and Chinese dishes (both vegetarian and non-vegetarian). The restaurant is large and has several tables. There is also a bar lounge in the ground floor next to the reception area. On the first floor, the lodge also has a conference room with conferencing facilities. The check in and check out time is 12 noon. The tourist lodge provides an economy option for budget travelers as well. The annex building is located right adjacent to the main building and offers 15 rooms that are much cheaper than the rooms in the main building. There are two floors in the building. A concrete stairway from outside leads to the lower floor and then an inside stairway to the upper floor. The rooms here, although a bit smaller than ones in the main building, are quite okay. All the basic amenities are available including TV (ordinary ones though), hot & cold water in the attached bathrooms, wooden floors, cupboards etc. However one of the key shortfalls here is the view. The rooms in the lower floor have no views at all. The windows open out to the backside of staff quarters. So you will be better off keeping the windows closed. The ones at the upper floor have some views though but the views are mostly blocked by trees. If you get the corner room (#24 which is a 4 bedded room) or the one next to it (#25, a double bedded room), you will still get some views through the trees. You can anyway go down to the backside lawn and get great views of the snow peaks. Rooms are fairly clean and staff clean the rooms everyday if you leave the key behind at the reception. Overall a good value for money. 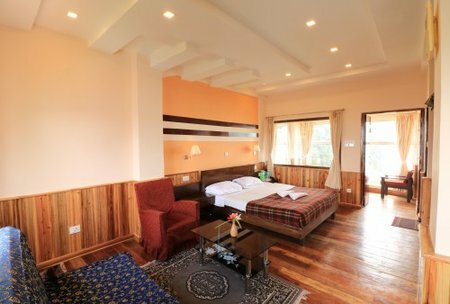 Among the 2-star & budget accommodations in Darjeeling, the tourist lodge is one of the best when you consider the location, rooms and amenities. However there are sign of aging clearly visible. The location is excellent and only 5-6 minutes from the Chowrasta Mall. However, this part of the Bhanu Sarani or Mall road where the hotel is located, is quite steep. So some elderly people may find it a bit difficult to walk back to the hotel from the Mall area. The hotel is great for families. It has lot of open space in front and a lovely garden in the back side for children to play around. 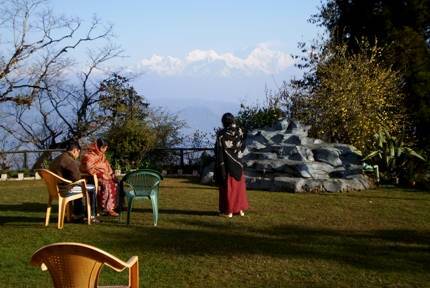 The lawn has lovely views of Kanchenjunga and the mountain range. The in-house restaurant is okay, nothing great. I thought the food preparations are a bit bland. But tolerable. They make north Indian and Chinese dishes. Tariff includes complimentary breakfast (they keep switching the scheme for Annex). And in complimentary breakfast you have choice of bread, butter, jam, egg (single), tea etc or puri, sabji, tea. But only two very thin slices of breads are offered which may not be enough for most. And unless you ensure, they may not be even toasted to any standards. However quality of Darjeeling tea offered is usually great. I have noticed an exception in Kurseong tourist lodge where thickness of bread, and food quality in general was taken care of, both being part of the same state tourism. Kurseong lodge restaurant has another problem of flies though and since ages. A mystery I could not solve until now, but that's another story. The private covered balconies in the main building's rooms are special and offer some of the best views of the mountain range, valley and tea estates. Most of the staff have been working here since many years. For example, one of my favorite waiters Balakrishna has been working here since 1998. Being a state government owned hotel, the service can be quite slow at times and the waiters may sometimes look dispassionate. They don't mean to be so, but that's how they appear to be. Probably the age and the routine monotonous work is showing in their expressions. But some of the young ones are exceptionally good. Don't be surprised if you hear at the reception that the bar is closed because the person who operates the bar hasn't turned up or gone off early while keeping with him the bar key. From the Chowrasta Mall take the left part of the Mall Road (also known as Bhanu Bhakta Sarani). Walk up to the Gorkha Ranga Manha (the large building with a sphere on top) which is about 5 minutes from the Mall. On the right you will see an uphill road which goes by the side of St. Andrew's Church and then the Darjeeling Gymkhana Club. There are signs of the tourist lodge along the road. At the end of the road (about 1 minute from Ranga Mancha), you will see the main gate of the lodge. Darjeeling Tourist Lodge, Bhanu Sarani, Darjeeling 734101, India. 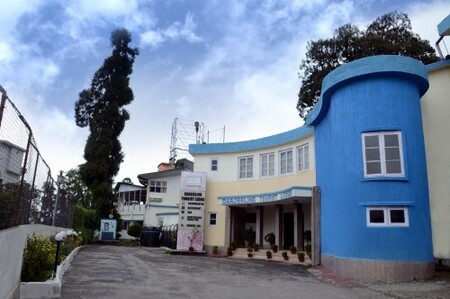 Note that Darjeeling Tourist Lodge is run and administered by West Bengal Tourism Department (WBTDCL). You can book online through WBTDCL's official website www.wbtdcl.com. Once you visit their website, you will get an option for 'Online Reservation' where you can book rooms of Darjeeling Tourist Lodge in both main and annex buildings. For manual booking, visit a WBTDC office. Their office in Kolkata is at BBD Bag near the mini bus stand. This tourist lodge has a nice garden, a clean and big dinning hall. Staff behaviour is very polite and helpful. Room tariff is not too high...but food cost is too high and food quality is very poor. Annex building rooms are not maintained properly. I don't know the condition of the main building. And this lodge is too uphill from the mall... difficult to reach, shop or get a shared cab. Hi Raj! Firstly your website is extremely exhaustive. Thank you so very much for all the information available here. I have one question for you. Which would be the closest taxi stand I should get a share taxi to on arrival, so as to walk the least distance to the tourist lodge? Hi, shared taxis won't come close to Darjeeling Tourist Lodge, they usually drop you at the lower town (Chowk Bazaar motor stand) and it's a 25 - 30 minute strenuous uphill walk. You can alternatively take a reserved taxi from the Chowk Bazaar stand up to the tourist lodge which can cost around Rs. 200/-. 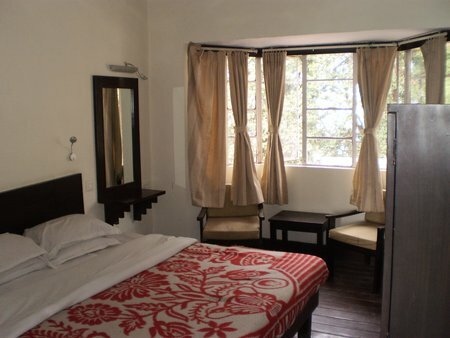 Hi, I have tried to book online standard double bedded room in Darjeeling tourist lodge main building. We are three persons. My husband, me and my daughter who is also an adult. But max no of persons in those room allows 2 while booking. I am ready to pay extra person's charge. How shall I do it in online booking? 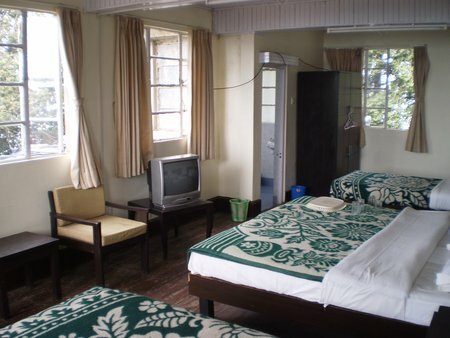 Hi, you can not book 3 adults in a double-bedded room of Darjeeling Tourist Lodge, although child is allowed. You should instead book a 4-bedded room for three of you or try to manage on the spot. Hi there, I am planing to stay in Darjeeling tourist lodge with my family 4 +1 in Jan'17. Can you please inform about facility for food for child. Any special cooking facility in lodge for child. There is no special facility for child. You can however go down to the kitchen and request the cook to make the food the way you want. He may comply depending on workload and availability of ingredients. Offer him tips. Dear Raj, I want the following information regarding Darjeeling Tourist Lodge:- 1) How far is it from Clubside Main taxi Stand at Nehru Rd & Gandhi Rd junction? 2) If I book prepaid taxi from NJP, will it drop me in front of Lodge? 3) Whether they provide car service for local site seeing? 4) Whether there are good eateries in close proximity to the Lodge. From Clubside taxi stand, it's 3-minute uphill walk to the Mall (chowrasta) and another 3-4 minute walk along Mall road. A steep uphill lane on the right and opposite to Gorkha Bhawan on Mall road leads to the Tourist lodge. Prepaid reserved taxi would drop you to the lodge but likely to charge a bit extra (about Rs. 100+). Darjeeling Tourist lodge provides sightseeing service and transfers, and have a rate chart at the reception which is quite reasonable. The whole of Nehru Road is full of eateries, but there is none on Mall road (not allowed). 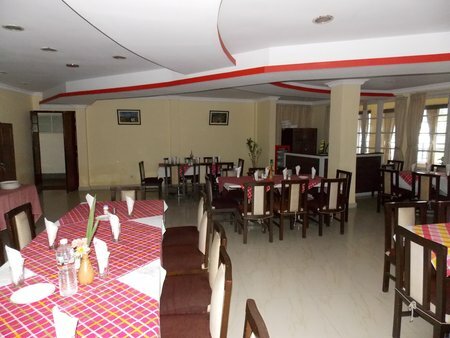 The Tourist Lodge itself has a restaurant and an adjacent bar area at the ground floor. The food at the lodge is very average and monotonous. 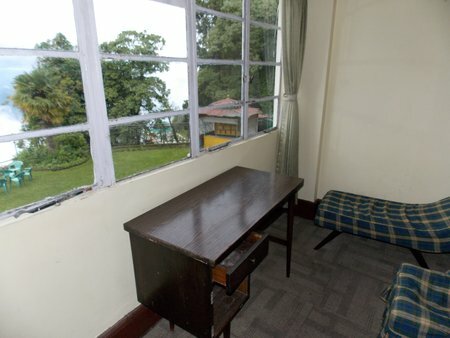 Enquiry about 4 bedded room in Annex building of Darjeeling Tourist Lodge. Is from the above mentioned room Kanchenjunga visible? Is complementary breakfast available for booking the above mentioned room? View is mostly blocked by trees. You might still get a little glimpse through the trees though. No complimentary breakfast in any Annex rooms. There is no way to exercise a choice of room or floor within a room-category, and this is how it is everywhere. But you can ask for it on arrival and they can provide if available on the day. If you are staying for several days, you can further make a request to shift you to an upper floor room as soon as it becomes available. Hey Raj, Thanks for the update. One advise needed - are u aware on which floors of the tourist lodge main bld are the Std Dbl Bed rooms. My question is - if there are no rooms on the ground floor then I need not worry & if yes, do they have proper view. Thanks in advance for your support. Standard double rooms are located at both ground and upper floors of the main building. The ground floor rooms are also nice and they have doors opening into the lawn at the back side. From the windows of these rooms and from the lawn, you get great views. Hi Raj, I have booked one standard double beded room in Annex Building. It's my first tour for me & my wife after our marriage. I need three informations:1) Can we use bar lounge for enjoying drinks? Atmosphere of bar lounge is ok for couple? 2) Does Darjeeling Tourist Lodge authority make arrangement for local sight seeing trip? 3) I will definitely show my original ID proof at the time of check in but does my original marriage certificate also req to proof the marriage relationship with my wife? 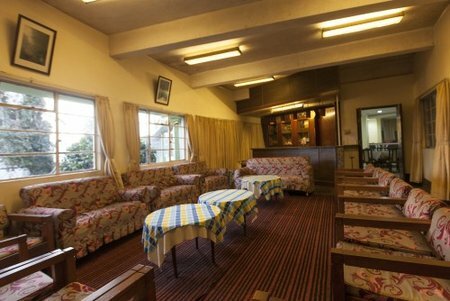 Bar lounge at Darjeeling Tourist Lodge is okay, but sofas etc showing signs of aging. It is often unmanned and not used by many guests. You may need to inform the reception staff and then they send the bar man. The service at the bar is often poor. Once I found the bar closed and the reason given was the bar man was absent and the bar keys were with him. So don't completely bank your bar plans on the tourist lodge. The dining room which often gets very noisy is adjacent to the bar with a connecting open door in between. So noise infiltration can also be a problem at times. The staff at the reception can arrange a car for you for local tours. But rates can be high. It is better to go through a tour operator like Ashmita. They also offer good discounts on Darjeeling Tourism Card. Both of you should carry ID proofs. No need for marriage certificate. Hi, There is no car pick up service of Darjeeling Tourist Lodge. Take a pre paid taxi from the NJP station. We found Darjeeling Tourist Lodge very clean, secured and quiet. It is best if you are planning with your family and also the back side garden is very nice specially for kids. But the bad part is room service, which needs to improve as well as the breakfast - only two slices of bread. I have booked 2 rooms on Annex building. Do they offer complimentary breakfast (i.e. Continental Plan) within the tariff? Yes they do ... toast, omlette, bread, butter/jam, tea or puri/sabji/tea etc. But only two slices of thin bread which may not be enough for most. Breakfast however is the same for rooms in both main and Annex buildings. Dear Raj, As I have planned for Darjeeling in next January I want to book standard double bed room in the main building of the tourist lodge. As I will book through website I am not getting information about the floor. Which floor will be best for view? And one more thing as I have 2 years old daughter can hotel provide 24 hrs water supply in January and also room heater? And above all am I taking risk by going there in January with my little daughter. Please help me as I think you will be the best person to answer these silly questions perhaps. Hi, The ground floor has restaurant, lounge, bar etc. They will give a room in the upper floor. Room heater is provided, but that may not be adequate for all. So take adequate winter protections. 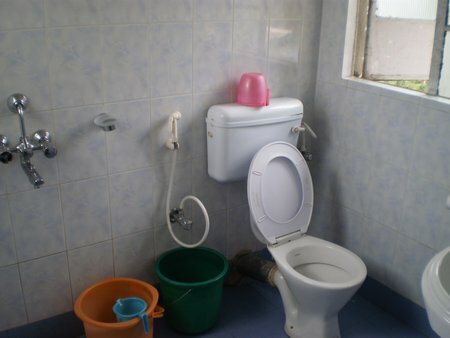 Being a government run lodge, they may not provide extra services like additional room heater etc. It can be biting cold out there and quite demanding out of a 2 years old. If you must go in Jan, choose a hotel with electrical bed heating systems like The Villa Everest. That hotel also has great views from the rooms although it's a bit of a walk to the Mall (about 12-15 minutes). You can go to the WBTDC website (mentioned in the above section), go through the booking option and you will get the rates. They will show actual rates (even discounted) depending on the date you choose. They allow extra bed. For tariff call them up or go down to the local WBTDC office. We checked in into Darjeeling Tourist Lodge and found it very clean, secured and quiet. Best staying option for family. No problem if your aged family members are with you. your car can go till the front of the hotel. The road is well maintained. it is not steep and fairly walk-able. There is an ample space to park your vehicle. We got room allotted in the Annex building and trust me it is as good as the rooms are in the main building. Only the view from room's on the 1st floor window open towards the quarter of the sub staffs but 2nd floor rooms don't have this problem. 24 hrs water supply (hot & cold) available. room service is average though they clean the rooms everyday. Hi, I have already booked in Annex Bldg in the tourist lodge since there was no other option and I stuck with WBTDC lodge, but after going through your review I became disappointed. Won't I get any Himalayan range view from the room of Annex Bldg? Again, please update me about the fooding facility. Hi, There is no view from most rooms in Annex building. But you can go out to the backside lawn and get all the views. The rooms are smaller compared to the ones in main building (although not really small) and have lesser amenities. You pay far less for the Annex rooms, so obviously you can't expect much here. There is no problem with food. Hi there. I am planning to book my stay in Darjeeling in coming April at the annex building of the tourist lodge. Can you please inform about the facilities, services and quality of rooms at the annex building of Darjeeling tourist lodge. Why the price difference is so huge in the main building and the annex building. Is there any option to view the photo of the rooms of annex building. Annex building rooms are inferior and therefore the difference in price. In Darjeeling, Annex hotel/building means economy option with low level services. Book rooms in the main building if you are visiting with your family. As I am planning to visit Darjeeling with my mother, she got problem with her walking .... so pls. tell me how can reach from jeep stand to WBTDC Lodge if I don't opt to walk .... what is the distance exactly. You can take a taxi from the jeep stand for a drop to the lodge. From the chowk bazaar (lower Bazaar) jeep stand, it would be some 30-35 minutes uphill walk to the lodge. Even for a normal person, it could be quite tiring, and with luggage it is not doable. The rooms are allocated as per the type (price category) you choose. All rooms in the same category are similar in amenities, views etc. So you need not worry. Can you please review or give some more information about wbtdc Darjeeling tourist lodge annex building. how far is it from the main building. Thanks in advance. The annex building of the tourist lodge is right next to the main hotel building and in the same compound. 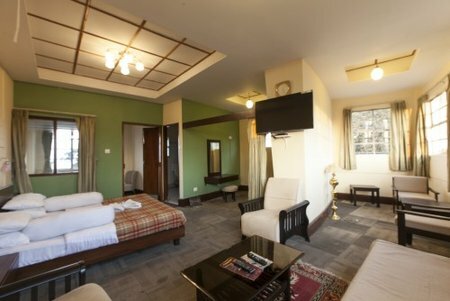 Hi Raj, Finally I have booked my stay at darjeeling tourist lodge. Rs 1800 per night with view and garden looks likr a steal to me considering what others are charging. Hopefully it will be a memorable first trip. Dipanjan, Yes, Darjeeling tourists lodge is a good choice. Large rooms with balconies and view of the Lebong race course at a distance below. I love them. The only issue may be the service ... government employed staff working since years ... Some of them are nice though.